Big Cunarder Is Launched in City, blared the headline. The Vesterlide, built by the Northwest Steel Company, was the first all-steel steamer built in Portland, and the first vessel built for the British line in the United States. 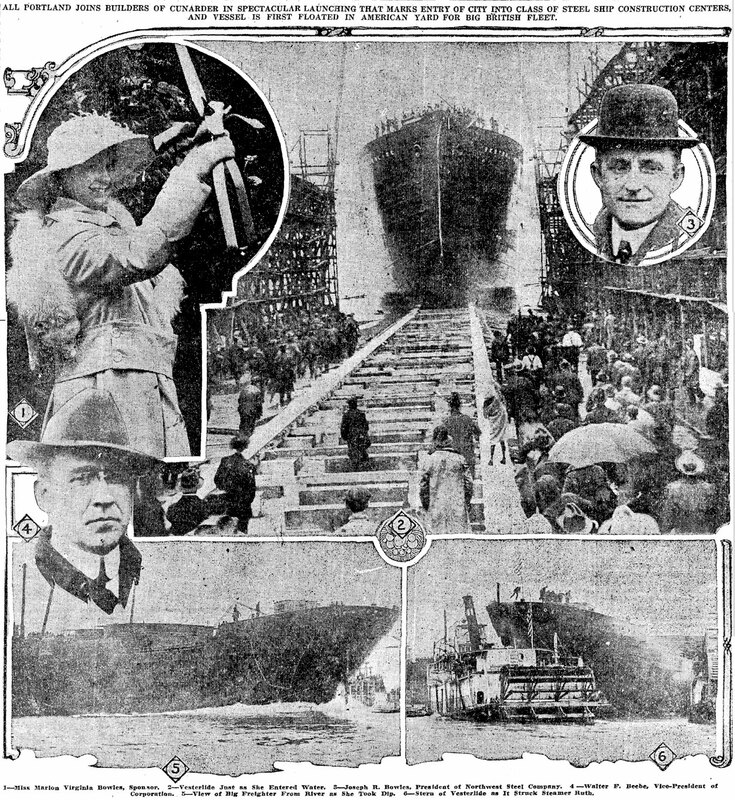 Throngs of Portlanders came out to witness the 2:12pm launch of the 8800-ton steel freighter. Mayor H.R. Albee issued a proclamation declaring the afternoon a holiday as far as possible. Neighboring businesses, like the Peninsula Shipbuilding Company, which built wooden ships, shut down so every employee could watch the launch. Even before the Vesterglide was waterborne, dozens on the great platform, which had been erected immediately in front of the bow, crowded around Joseph R. Bowles, president of the Northwest Steel Company, and Walter F. Beebe, vice-president, and were most complimentary in their expressions of congratulations. Beaming countenances of the officials indicated their delight, and in that they had every reson to feel so, it being the first ship built there and not a hitch was experienced in the launching. Unfortunately, on reaching the opposite side of the river the stern of the Vesterglide crashed into the side of the steamer Ruth, damaging her so she sank later, and three men were injured. I’m not sure how crashing into and sinking a steamer and injuring three men qualifies as “not a hitch,” but that’s how The Oregonian reported the news of the March 31, 1917 launch. Wow, thanks for the fantastic story and the accompanying image. The 15 year old girl who’s launching the ship in the photo – Marion Virginia Bowles – is my grandmother. And that’s only the second photo I’ve ever seen of my great-grandfather, JR Bowles (who was notoriously camera-shy).